Yeah, it is finally here! I am going to keep this short because I know a few of you visiting here are going to blog hop all day! Two cards today, a great guy card BELOW, be sure to scroll down. I used Weekend Sketch Challenge 99. The first card I saw made with this sketch used a full circle, hanging off the edge, instead of just a partial circle. I am kinda a fan of going beyond the edges. Check out HERE. The lace was pre-pleated, I ran a basting thread along one edge and pulled it until the lace formed a circle, you can do this with unpleated lace and ribbon too. The sentiment is part of a SU! wheel, I unmounted it and cut apart the sentiments according to the directions HERE. Ink: chocolate chip-SU!, worn lipstick and antique linen Distress ink, old olive-SU! 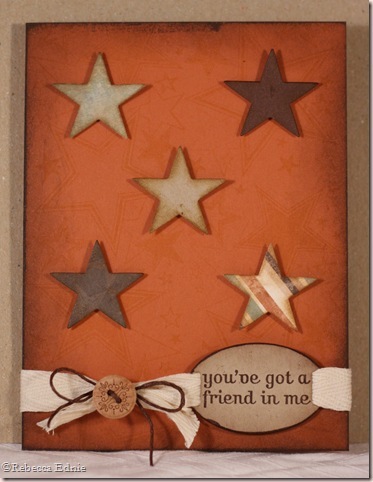 Paper: unknown DP, Bazzil CS (dark brown), old olive CS-SU! I saw a really cute card yesterday with multiple circles sewn on to the card. Sorry, I don’t remember where. I took the idea and changed it just a wee bit, using fewer elements and changing them to stars. This is another sentiment from the Friendship wheel. Cute button isn’t it? Must be laser etched the work on it is so finely detailed. I hope you will visit some more of my cards. Feel free to scroll down and if you really love a card, don’t forget to book mark that post, leave a comment and VISIT AGAIN! Paper: really rust, kraft, chocolate chip CS, DSP-SU! Accessories: hemp twine-Hemptique, tag die-Cuttlebug, star die-SU!, foam dots-Jody Morrow, twine and button-stash, chocolate chip marker-SU! 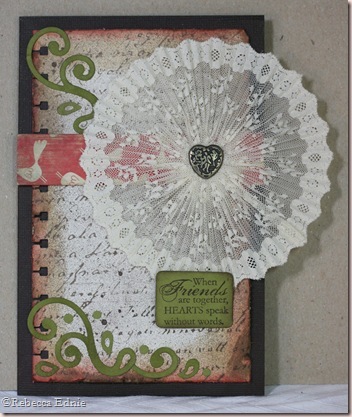 that lace doily is gorgeous!! and i love the star card too! Yes, your first is a stunner for sure. I really like the first card! So pretty and unique! :)Happy World Card Making Day to you and greetings from Finland!